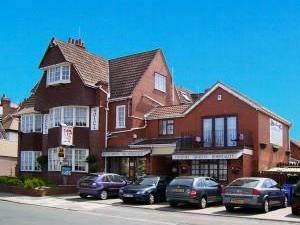 The Royal Bridlington01262 672433work01262 672118fax Guest AccommodationThe Four Star Royal Bridlington is located in the South Bay area of Bridlington and yet we are only 2 to 3 minutes walk from the beautiful South Beach. All of our 18 en-suite rooms have a TV, DVD,CD Radio Alarm Clock, tea, coffee and hot chocolate making facilities. They are all comfortably furnished and centrally heated and most have a sea view. Additionally, we offer a comfortable lounge with large screen television and a well stocked bar with open fire to wind away those nippy winter nights. We also have a large private garden where guests can relax. WIFI throughout. We can offer ground floor rooms if required and we have a good size dance floor which is ideal for sequence dancing. Food is high on the agenda at The Royal Bridlington with fresh local ingredients being used wherever possible. This together with the service of our friendly staff, makes a winning combination. The Royal Bridlington can accommodate up to 7 cars on our own off street car park and Shaftesbury Road has no restrictions for additional parking.